The project is designed to make the curriculum relevant, effective and responsive to the needs of local and global society. Curricular reforms focus on the five learning areas which stress integration and alternative approaches to teaching and learning. Thus, learning competencies in all areas have been redefined for clarity and focus on societal needs, and articulated with the secondary level. Likewise, instructional materials that will address the needs of the children and help improve their performance have been developed. Computer Education for Public Elementary Schools. This utilizes educational technology to enhance learning and improve the overall quality of elementary education specifically in Grades IV to VI. This is a quadrennial search for public elementary schools with the most effective quality of instruction in Math and Science based on pupil performance and effectiveness of school programs in Math and Science. Materials Production in Braille and in-Large Print. Resource materials being produced are for the blind and those with low vision. These materials include textbooks, which are computerized in Braille and in-large print, are intended for both the elementary and secondary students. This is a DepEd initiative to develop school system effectiveness among public elementary schools through quality standards. The APPES is an evaluation system designed to challenge all public elementary schools to raise their standards and the efficiency of the system. It seeks to empower all public elementary schools to strive for excellence through recognition and enlightened self-evaluation based on the agreed upon standards of excellence and incentives. ECARP is an inititiative to directly address the literacy thrust of the Department of Education. The program aims to make every Filipino child a reader by Grade Three and have mastery of the literacy skills at his/her level. The program involves materials development for both teachers and pupils as well as training of teachers on the utilization of said materials. a) Teacher Self-learning Modules (TSLMs). The TSLMs are designed to equip primary grades teachers with the necessary materials to improve their teaching of reading. b) The Philippine Informal Reading Inventory (Phil. IRI). The Phil-IRI is an authentic reading assessment tool that attempts to evaluate the reading proficiency level of public elementary pupils nationwide. It is an informal measure that determines the children’s use of comprehension, vocabulary and word identification strategies within the context of the story, passage or poem. It provides teachers with both quantitative and qualitative information about the children’s reading capabilities. In support of the DepEd’s thrust to improve public elementary education, the Bureau of Elementary Education (BEE) through the Staff Development Division (SDD) has institutionalized the conduct of a national conference of chiefs and assistant chiefs of elementary education. Participants to this conference are the chiefs and assistant chiefs of elementary education in the 17 regions with the director, assistant director, division chiefs and assistant chiefs of the BEE. 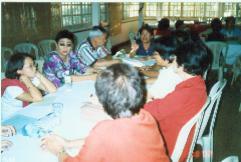 For 2004, the conference was held at Banaue Hotel, Banaue, Ifugao where the participants were able to: 1) identify problems/critical areas in the pilot implementation of BEC and the Rating System; and 2) determine the status of Phil. IRI and the corresponding interventions implemented. The participants were also oriented on the pilot implementation of APPES. Pre-planning meeting with the host region for the next conference was also held. This serves as the human resource development strategy of the bureau geared at strengthening employee commitment and developing their competencies and career life. It consists of a continuous Multiskilling Program for all personnel by sending them to degree and non-degree training courses (local and abroad), conduct of Learning Action Cell (LAC) and implementation of Goodwill, Awards and Incentives Programs. This project aims to provide administrators’ knowledge on educational services on inclusive education for children with special needs in their respective regions/divisions/schools. The Multigrade Program in Philippine Education (MPPE) supports the DepEd thrust to improve access, equity and quality in the delivery of basic education through capability building of multigrade teachers, documentation of effective practices in MG schools, preparation/provision of school buildings and facilities through Adopt-A-School Program and sustainability of the implementation of the awards and incentives system. The Search for Multigrade Teacher Achiever, a sub-project of the Multigrade Program in Philippine Education (MPPE), is a quest for the most outstanding teacher assigned in a multigrade school. The award recognizes the exemplary performance, contribution, and dedication of multigrade teachers to the development of school children in disadvantaged, deprived and underserved schools in far-flung areas. The search also serves as an avenue to provide assistance to these schools and recognize the efforts of the community in supporting education. This, likewise, supports the efforts in the MPPE to retain quality teachers in the Multigrade schools. 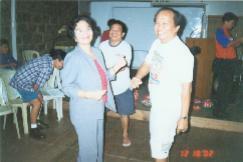 Awarding of thirteen (13) winners for the 2003 Search was held last March. The Training Video on Multigrade Instruction is a documentary video on multigrade teaching practices. It shows effective teaching strategies and other important information about the multigrade school. It serves as an orientation and in-service training material on Multigrade instruction for multigrade teachers and school administrators. It could be used during training sessions in schools, divisions or regions or as a self-learning training video for new Multigrade teachers. Two hundred thirty (230) copies of training video with viewing manual/facilitator’s guide were reproduced. Said training videos are being readied for distribution to the regions and divisions next month. The project is funded by the Coca-Cola Foundation Philippines, Inc. in coordination with DepEd. This is a 5-year project which aims to provide fifty (50) adequately equipped three-room school buildings in priority Multigrade schools in the country since its inception in 1998. Training of MG teachers, school administrators and supervisors on MG instruction is part of the project as well as training on leadership skills for PTCA members. Last summer, the Summer Training on MG Instruction (Phase III for Batch 5) was held at Traders Hotel. A total of sixty four (64) division coordinators, schoolheads and MG teachers participated in the training. This is an alternative mode of delivery of basic education to address the need of regular children including those with disabilities. It also involves the development of support learning materials for teachers especially those in the far-flung areas. Distance Training for Teachers (DISTEACH) is a program for teachers where majority of the instruction occurs while teacher-trainees and trainers are at a distance from one another. Interaction is done through the use of print and non-print materials. Print materials come in the form of modules, course guides/text, readings and other print formats. Non-print materials include cassette/video tapes and CDs. This program aims to reduce the incidence of dropout and improve the achievement level of pupils through the implementation of interventions such as breakfast feeding, multilevel materials, parent-teacher partnership and provision for school supplies. For its positive results, the program was institutionalized in ten (10) divisions and forty (40) schools. The project supports the DepEd’s thrust to provide preschool experiences to 5-year old children most especially in the disadvantaged areas. This program was launched in 1993 and was initially implemented in the twenty (20) priority divisions for countryside development programs. Early Childhood Development Project. This provides integrated services on health, nutrition, psychological development and early education for disadvantaged children 0 to 6 years old in Regions 6, 7 and 12. The project addresses the problem faced by Filipino children such as infant and child mortality, malnutrition, poor psychosocial development and low school readiness. Readiness tests and achievement tests in Grade I are administered to find the effect of the 8-week curriculum on the readiness and achievement level of the Grade I children. 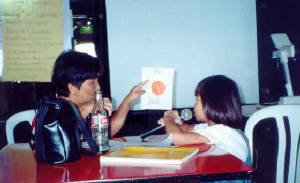 In March 2004, sixty (60) classes were given achievement tests. Forty (40) classes were also given pretests this opening of the school year. Seven (7) sets of monitoring tools have been developed to evaluate the implementation of the project. Preschool Service Contracting Scheme. This project is a six-month program that provides preschool experiences to prospective Grade I enrollees in the 5th and 6th class municipalities and in urban poor areas. Service providers are private schools and/or NGOs that are involved in early childhood education. 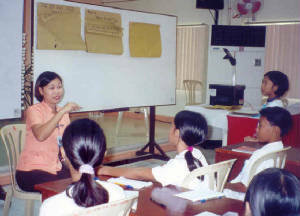 DepEd Preschool Program. This project provides preschool experiences to 5-year old children, most especially in the disadvantaged areas. This project was launched in 1993 and initially implemented in the twenty (20) priority divisions for countryside development programs. Headstart Program for Gifted and Talented. This is a preparatory program for 5 year-old children who manifest superior intelligence beyond their chronological age. This will address the education, aesthetic and social needs of these children. Please call us at (632) 633-7270 for more details.